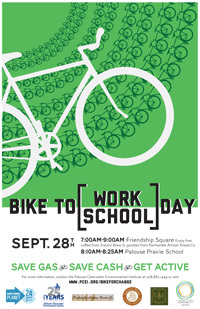 Bike to Work/School Day this Wednesday! 7:00am-9:00am @ Friendship Square – Enjoy FREE coffee from Sisters’ Brew (please bring a reusable mug), munchies from Panhandle Artisan Bread Company, and bicycle cookies! We will also have bike maps, literature, free stuff and more. You can also make a pocket change donation to build a community bike rack. Visit http://tinyurl.com/3o9yzza for a map of locations. For more information, contact Jen at info@pcei.org or (208) 882-1444.